EAGLE DAYS at 1000 Islands Environmental Center is an all day event. Join us for the annual celebration of the Bald Eagle on January 26, 2019. Activities will include eagle observations, presentations, hands-on activities and a craft for the kids. Plan to join us also on January 26, 2019 for an opportunity to see a live Bald Eagle up close. Learn all about eagle biology, ecology, natural history and cultural connections in an engaging and entertaining presentation by a naturalist interpreter from the National Eagle Center in Wabasha, Minnesota. No admission or advance registration is required. Daily programs are scheduled for 10AM, 1PM and 3PM. Watch our Facebook page and website for more details. The 1000 Islands Environmental Center is located at 1000 Beaulieu Court in Kaukauna. The Kaukauna Public Library will also be hosting Eagle Day events on January 26, 2019. “Raptor Rehab: The Trials and Tribulations of Protecting American Bald Eagles and other Raptors” from 11:30am to 12:30pm – Wildlife rehabilitators from Wildlife of Wisconsin (WOW) will teach us about some of the common threats to our area raptors, meet. Plan to attend and hear stories about some of WOW’s educational raptors as well as to learn how rehabilitators and even you can protect the magnificent animals yourself. The Kaukauna Public Library located at 207 Thilmany Road will also be hosting a wide variety of activities that day. We’ll also be celebrating Bald Eagles on January 26 at the Paper Discovery Center (PDC). Hoo’s Woods Raptor Center will be doing a live raptor show that will include a Golden Eagle, Snowy Owl and a flight demo with an owl. Robert Rosenfield, Professor of Biology at UW Stevens Point, will be presenting his research on Cooper’s hawk and bringing his Great Horned Owl. In addition to the two speakers, we will have information on Bald Eagles, an owl craft and who could forget the guests of honor: The Bald Eagles on the Fox River. Meet some raptors and learn more about Bald Eagles with us. 10:00 AM-4:00 PM, as well as seating at ONE of the live animal shows. Limited seats available. No one will be admitted without a ticket. Tickets can be purchased at Purchase Tickets. For more information, go PDC website. The PDC is located at 425 W Water St, Appleton, Wisconsin. Winter is an excellent time to get outdoors and survey the abundance of wildlife that the Fox River Valley has to offer. On Saturday, January 12th, outdoor enthusiasts and those with an eye for eagles will have opportunity to participate in the eagle monitoring and waterfowl survey. Data collected will be compiled by the WDNR for both the state and federal report. Volunteers are needed to help collect this data. This month’s monitoring session takes place from 6:50 to 8:30AM at various Fox River Valley locations. See map for directions to sites. Those wishing to help out at a specific site should contact Cheryl at croot@newalliance.org. Others wishing to visit more than one site should feel free to just drop by and meet monitors and help with observations. No experience necessary. Fun for the whole family. A reception is scheduled to take place at Atlas Waterfront Cafe from 10:00 until 11:30. 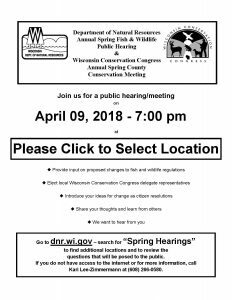 During this time monitors will share their experiences and a WDNR wildlife specialist will give an update on data collected over the past year. The reception is made possible through financial support of Evergreen Credit Union, Appleton, Wisconsin. Visitors are invited. There are a number of us who participate in the eagle monitoring program hosted by WDNR. We count the eagles we see along the Fox River for 90 minutes during sunrise, once a month during November through March. We often see other wildlife, especially waterfowl. This past Saturday, December 8, 2019, it was 10 degrees at sunrise; fog was rising from the water’s surface. As the sun rose higher in the sky and before I left my monitoring site, the fog was so dense you could hardly see across to the other side of the river. The distinct coloring of the male goldeneye is shown beautifully in the photo below. With their white body and black back and their greenish-black head with a white spot on each side of their face, the males stood out even in the fog. 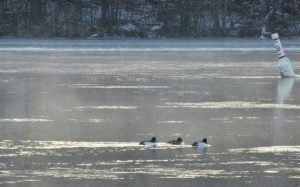 In the video below I’ve recorded a flock of Common Goldeneye ducks lifting off the water. If you listen closely, you’ll hear the whistling of their wingbeats. They would fly west down the river and then float back. Ah! The life of a duck!! “Common Goldeneye (Bucephala clangula) is a Special Concern species in Wisconsin. It is a medium-sized diving duck with a chunky body and a large head. The males are white with a black back. The head is greenish-black with a white spot on each side of the face. The females have a light-brown head. They have a white belly, breast and flanks, interfaced with a gray back, wings and tail. Both sexes have a distinctive bright yellow to pale yellow eyes. 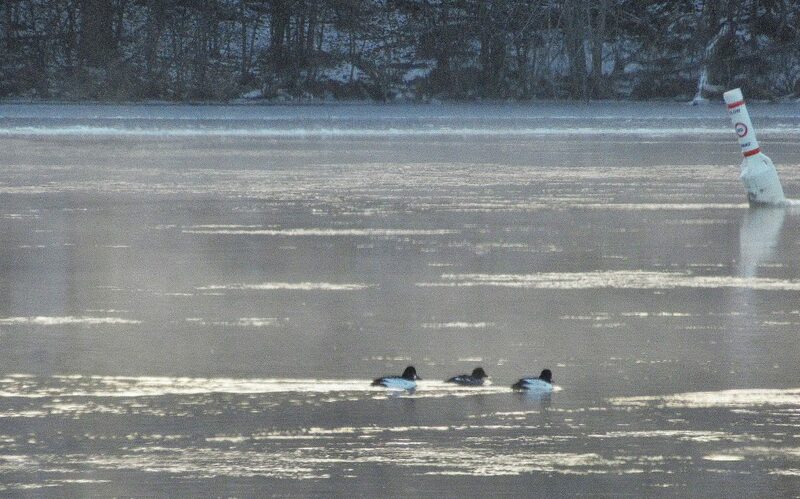 Added note: Common Goldeneyes can reach speeds of 40 mph in flight. Photo from the Gulkana Wild and Scenic River in Alaska by Bob Wick, Bureau of Land Management – Alaska (@mypubliclands). Today, June 20, 2018 is the day America celebrates its national bird, the bald eagle, for American Eagle Day. On June 20, 1782, the bald eagle was placed at the center of the Great Seal of the United States and remains an inspiring symbol of our country. After a dramatic recovery, following the banning of DDT, bald eagles are now found in every state but Hawaii, soaring high and inspiring the nation. For more on the fight to get rid of DDT, go to Banning DDT. Wisconsin residents can celebrate the continuing comeback of bald eagles and help fund the next conservation success by buying a bald eagle license plate. Wisconsin residents can celebrate the continuing comeback of bald eagles and help fund the next conservation success by buying a bald eagle license plate. 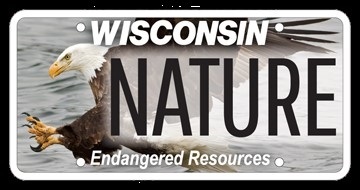 License plate sales and donations to the Endangered Resources Fund account for 25 percent of funding for work by DNR’s Natural Heritage Conservation staff with endangered species and natural areas. MADISON – State ecologists conducting aerial surveys for occupied bald eagle nests this spring are asking for the public’s help in locating nests in southeastern Wisconsin. The discovery last year of a bald eagle nest in Kenosha County leaves Milwaukee and Walworth counties as the only remaining counties with no confirmed active bald eagle nests, though conservation biologists believe it is only a matter of time before the nation’s symbol sets up housekeeping there too. “We’ve been able to add a number of ‘new’ bald eagle territories in southeastern Wisconsin over the past couple years, thanks in part to crowd-sourcing information from people calling in their observations as well as the ongoing efforts of the Wisconsin Breeding Bird Atlas,” says Sharon Fandel, southeastern district ecologist for the Wisconsin Department of Natural Resources. 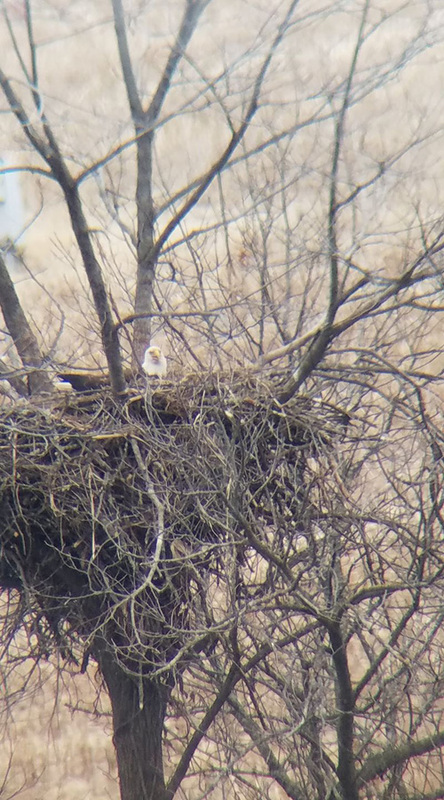 Fandel already has completed aerial surveys this spring with DNR pilots to look for occupied bald eagle nests in southeastern Wisconsin and has confirmed seven new nesting locations. About half of them came from citizen reports and the other half resulted from honing in on areas with clusters of reported eagle observations from WBBA and other birding reports. “Now we’re hoping more people will let us know about possible occupied bald eagle nests to check in southeastern Wisconsin, particularly in Milwaukee and Walworth counties,” says Fandel. Aerial surveys are underway across the state now to check known eagle nests to see if they are actively being used by breeding adult eagles. Survey data are used both internally and externally to protect these nest sites when various activities are being planned across the state. for southeastern Wisconsin specifically, you also can provide location information directly to Sharon.Fandel@Wisconsin.gov. In other good news, the bald eagle pair confirmed in Kenosha County last year is back. They’ve built an alternative nest on an adjacent landowner’s property closer to a couple larger ponds, Fandel says. Bald eagle populations have gradually recovered in Wisconsin and nationally as a result of the banning of the pesticide DDT nationally in 1972 (and in Wisconsin in 1969), a prohibition on killing of eagles, improved water quality in lakes and rivers, nest protection, and reintroduction of eagles in some areas. Bald eagles were removed from Wisconsin’s endangered species list in 1997 and from the federal list in 2007. 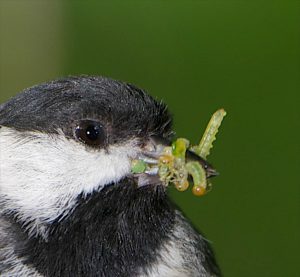 In 2017, Wisconsin aerial surveys confirmed a record 1,590 occupied nests. According to the USGS, wind turbines collisions kill between a quarter to a half million birds annually. Researchers from the College of William and Mary, however, have built a warning system they call the Acoustic Lighthouse. This invention emits a high-pitched sound which warns birds to look ahead and slow down or stop before they impact with the wind turbine. This device could be used on tall buildings and other towers like those used for storm warnings and cell phones. I for one would be grateful to have these devices placed on the 86 wind turbines that stand just two miles from the 11,091 acres that make up Horicon Marsh here in Wisconsin.